A steep rise in kidney disease in farming communities in Sri Lanka has baffled doctors and researchers struggling to pinpoint the factors making people in several rice-growing districts vulnerable to the debilitating illness. Medical researchers say the numbers have been steadily climbing since the high prevalence of the disease was first noted eight years ago in North Central Province, where over half the population is engaged in agriculture. Besides North Central Province, the ailment is prevalent in the North-Western, the Eastern and Uva provinces. “The problem first came to light in Anuradhapura [a district in the North Central Province] around 2000,” Navaratnasingam Janakan, the consultant epidemiologist at the Health Ministry’s Epidemiology Unit, told IRIN. “It is an emerging health problem,” he said, adding that it seriously jeopardised the health of those who got it, and the high economic cost of treatment “is a burden to the patient, family, community and health system”. Statistics from the Provincial Directorate of Health Services reveal that in 2003 just over 1,300 patients with chronic kidney disease received treatment in the worst-hit North Central Province, with almost 200 patients dying of renal failure that year. The most mystifying feature of the problem is that most of those affected are farmers, and mostly male members of farming families. According to health officials, many of them do not have the pre-existing conditions of hypertension or diabetes that usually lead to renal disease and failure. But we have yet to uncover the exact aetiology of the disease. We can only guess at what the causes might be. Local researchers have homed in on some of the possible environmental and socio-economic risk factors. They include a high fluoride content in the groundwater in some of the affected areas, the farming community’s exposure to inorganic pesticides and fertilizers, the leaching of heavy metals such as cadmium from agricultural chemicals into water sources and the use of low-quality aluminium pots and barrels to store drinking water. “But we have yet to uncover the exact aetiology of the disease. We can only guess at what the causes might be,” the Health Ministry’s Janakan said. In May, the Health Ministry invited the World Health Organization (WHO) to assess the current findings of local researchers. Among its initial recommendations, the WHO team of experts suggested further studies using non-affected agricultural regions as controls and a series of preventive measures. Advice on prevention will come too late for 37-year-old Anura Bandara, a farmer from Galgamuwa in Anuradhapura District. He sought treatment at the Anuradhapura Teaching Hospital one and half years ago for fatigue, dizziness and other symptoms only when he found it difficult to work in the rice fields. Months later, he began regular dialysis treatment for his failing kidneys and he can no longer work and provide income for his family, including a wife and two children. “Now my stomach, hands and legs are swollen,” he said while hooked up to the dialysis unit. “I have not been able to work for a long time. It is very difficult for my family.” He knew of two other farmers who had also developed the same disease. 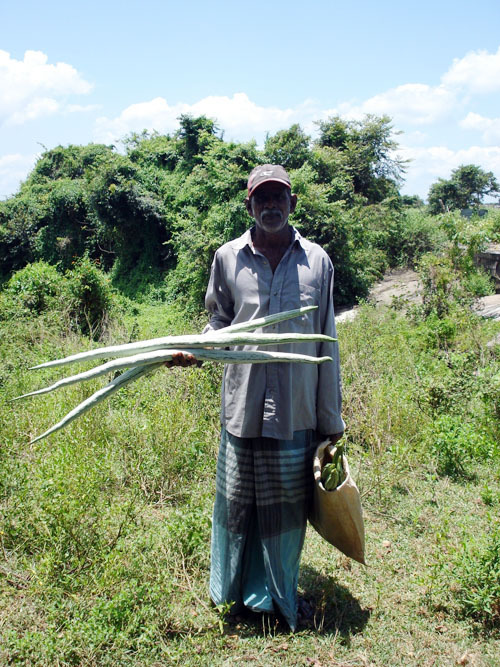 A Sri Lankan returnee farmer carrying snake gourd vegetables. He was one of those who got treatment at the hospital’s regular weekly clinic for patients with kidney disease. “Right now there are at least 4,000 kidney patients in the Anuradhapura District alone and about 1,500 come to the hospital for treatment every month. Every week at least 15 new patients are registered,” said Dedun Dias, attached to the Anuradhapura Teaching Hospital’s Kidney Unit. Administrators in the health sector are concerned about the heavy burden the growing numbers of these kidney patients place on the national economy and public health resources. The insidious nature of the disease means many patients seek treatment in its advanced stages - when only expensive dialysis or organ transplant can save lives. Government figures also show the morbidity rate for diseases of the urinary system, which includes chronic kidney disease, also jumped from 727 cases per 100,000 in 1980 to 1,155 per 100,000 in 2005. “There are issues of grave concern such as the lack of treatment facilities for dialysis and renal transplant, and for rehabilitation,” said Janakan. Dialysis units are available in only 11 government hospitals for free treatment; 100 machines are available in both state and private hospitals to treat some 2,000 patients a year. While researchers battle to identify the disease’s exact causes, weekly clinics in hospitals, and field visits by medical teams to vulnerable communities in rural areas, are the first line of defence. These steps have resulted in an increased number of early detections of people with kidney ailments. Advocacy carried out by the outreach teams to instill preventive measures, such as drinking filtered water and using clay pots for storing water, are also expected to stem the disease in the longer term.